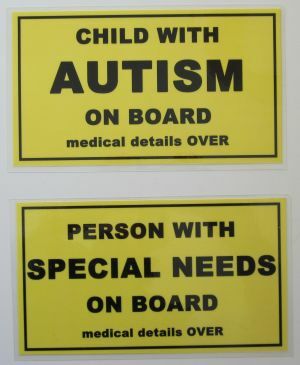 Both our "Child with Autism on Board medical details OVER" and our "Person with Special Needs on Board medical details OVER" signs measure 8 inches x 4 5/8 inches (20cm x 12cm) and are made in Canada by a small business close to us. Does your loved one with special needs ride in different cars? Do they sometimes travel with a family member, a caregiver, a babysitter or a friend? No one likes to think about getting in an accident or even a fender bender but if your loved one is a passenger with yourself or someone else and an accident does happen, would the first responders (police, firemen, paramedics) have access to critical information about your child? Anyone who travels with a person with special needs as a passenger invariably thinks about that person's safety in the event of an accident. Even though we hope and pray nothing will happen, we're programmed to think of all scenarios and plan accordingly. And when our loved one goes out with someone else, we're lousy at turning off the worry the whole time they're gone. If my sister were alive and traveling with me, I would absolutely need SOMETHING in the car to tell medical personnel her basic information if we were in an accident and I was incapacitated. Even though she was high functioning, she would not have been able to tell a paramedic about her heart condition or her blood type, she wouldn't have spoken to them at all. And if she were out with my husband, it would be even more important to have those medical details recorded somewhere in the vehicle. So even though I've never liked those "Baby on Board" signs, I REALLY liked the idea of a sign that alerts fireman, police officers and medical personnel that someone on board that vehicle has special needs. This lead us to design 2 signs, and with the valuable input from our Facebook fans we are thrilled with the results. Unique Feature: "medical details OVER"
Both signs are UV protected laminate that are intended for placement ON THE DASHBOARD of your vehicle. We opted for a removable sign because, as one Mom said, it can ride in the ambulance with the child on the way to the hospital. But we wanted a removable sign rather than the more common vinyl decal mainly because we wanted something that can be kept if the car is sold, easily placed in a different vehicle or taken out if the child won't be a passenger on that trip. And it was a priority to have a sign where a fireman could reach into the car, pull it out and learn critical information about the passenger. 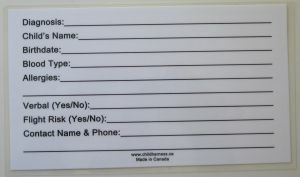 No other sign on the market has space on the back for you to record important information about your child. Use a permanent marker to write on the plastic laminate. If you do not want to list your child's personal information, use the space to write instructions to the rescue team, for example, "See medical details in glove box" or "See info packet under driver's seat". Diagnosis. Use this line to record information such as Deaf, Visually Impaired, Asperger's, Down syndrome, Epilepsy, Cognitive Impairment, ADHD, etc. Child's Name. Include their nickname if that is what they are most accustomed to hearing. Allergies. This is critical, especially if they need medical attention but are allergic to (for example) Penicillin. Contact Name and Phone. Use this line to record the information of someone who should be contacted in the event of an accident. The rescue crew will get the driver's information from their wallet in the car. 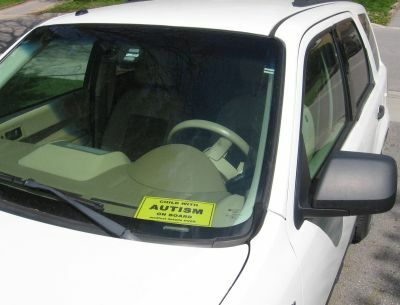 The sign is placed on the dashboard in the front windscreen similar to a wheelchair parking permit. This is a practical alternative for any vehicle, especially those that have deeply tinted side and rear windows. Text Box for alternate shipping address, comments or instructions for us.